Only stories will feed the Beast! A giant monster invades the 25th century, killing millions. The only thing that calms it is stories. It’s been contained within the Manor, a country estate. The Master, ruler of future Earth, is the only person the Beast will let read stories to it and live. The Master transports his 21st century ancestor Bob to the future. Bob stands in for the Master while the Master travels back to our time to unravel the mystery of the Beast’s origins. 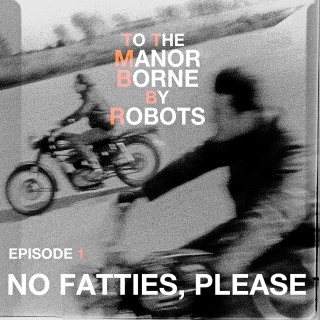 This premium premiere episode features No Fatties, Please: an outlaw biker’s search for love spurs reminiscence on how he and his bros in Satan’s Disciples killed Osama Bin Laden.